Mickey Mouse wants us to get up and MOVE! 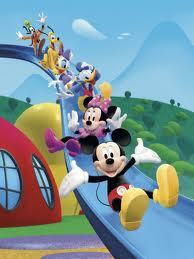 As part of Disney’s Magic of Healthy Living Initiative, Disney Junior is helping kids to do just that. When Disney Junior debuts on The Disney Channel this Monday, February 14, Mickey as well as his friend, Special Agent Oso, will encourage children to get up, move, and play along, rather than just sitting and watching. On “Mousekersize,” Mickey and friends will demonstrate how to move and burn all that good energy, while “Special Agent Oso: Three Easy Steps” features Oso and his friends as they observe a live-action kiddo models three easy steps to exercising and eating right. So, what do you say? Grab those sneakers and sweats, and let’s workout with Mickey!